Hello. If we were having a coffee this week, I’d be back on caramel macchiatos. I think that’s what I used to have. I’m quite enjoying a Mexican single origin coffee at the moment. It has very strong tasting notes which, in a way, make it not taste particularly like coffee. My car had its MOT last month. It had one “advisory” note about one tyre going slightly bald on the inside shoulder. Not enough to fail the test, but something to keep an eye on. That would have been a calendar month ago. I don’t know whether I’m really sensitive to it or whether it is obvious, but I can feel when something isn’t right with the cars I’ve had. I’d noticed this one wasn’t quite as steady as it had been and appeared to be pushing them (rather than them rotating) when I put a lot of lock in to the steering. When I checked the front tyres, they were smooth on the outside of both and down to the tread depth gauge on each as well. I ordered two new ones and for the confirmation text. I’d done the same thing a year to the day ago. That was quite an amusing story to me, but for the fact that I’m disappointed that my tyres only lasted a year. My friends pointed out that if I drove a bit more slowly they might last longer, but one of them is a bonafide “Dad Driver” so I’m not sure how much attention to pay. Besides, tyre wear happens more when the tyre skids than when it grips. Cornering speeds are somewhat limited to the traffic that you’re in, and accelerating in straight lines shouldn’t do so much damage, so I’m wondering if it needs to be four wheel tracked. Yesterday I got on a train. I don’t do trains so often anymore because they don’t go where I want to go quite so well as they used to. I maybe get on one every few months, but very rarely to Liverpool. But on Timehop it flashed up yesterday that I also got on a train to my home city a year ago. Again, not so interesting but defo a coincidence. Can’t think why I was going there a year ago, either. Maybe I can actually. I remember having brunch there, and I wouldn’t have taken the car, so probably that. Erm… While we’re in the past… When Moo first came to live with me, we got pizza. 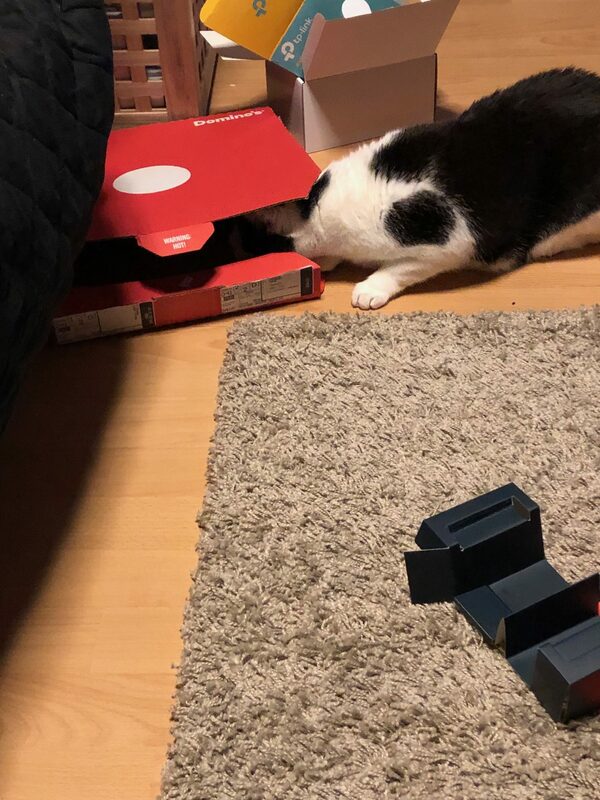 He found the box (and the pizza, actually) fascinating and it was a sad for him when I had to get rid of the box. Somethings, though, never change. Excuse the boxes, I was sorting some network stuff. Moo spends most of his time sat here now, though. He’s got used to his new room. And again, because I likes these quotes and they came up, I thought that I’d post them. Moving to the present day (comparatively). 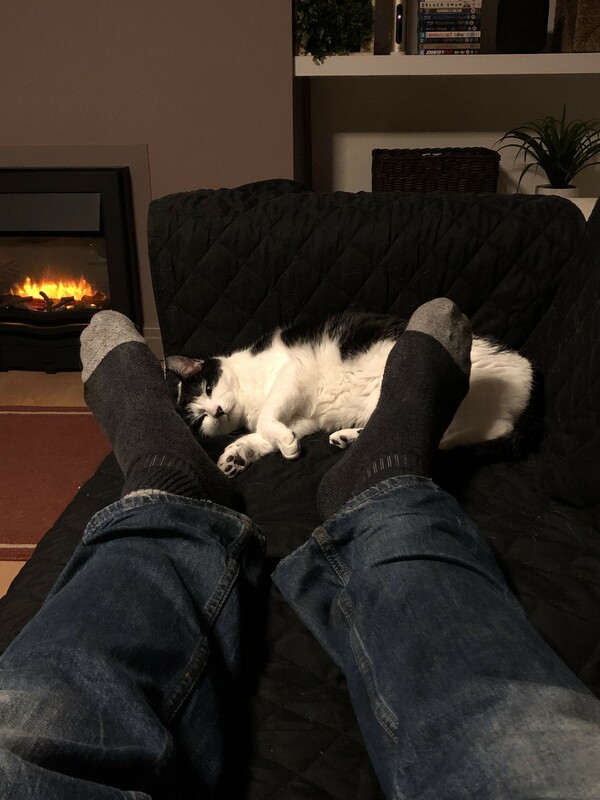 On Friday I had a physio appointment to try to take some knots out my legs before I go snowboarding. I’d been remembering every day of my need to take shorts with me to work on Friday as I was going straight from there to the appointment. As I drove past the place on my way to work, I realised I’d forgotten shorts. While we’re on work… On my first day back, my boss organised a meeting to discussing something which is perpetually a non-issue but keeps getting complained about by one particular person. He asked me to a value stream model. I didn’t really see the point, not least because it was a non-issue but also because we wouldn’t be changing the process, so inefficiencies in timing were somewhat immaterial. I completed the VSM having gone through a sh*t load of data and user interviews, and sent it off for review before the real discussion began. I get a note back from my boss not understanding what it was showing, and that it didn’t give us a way forward. I can only assume that he’s never done a value stream model before and that he maybe pulled it out of his Big Book Of Management as a good idea, but I did also point out to him that we told him many, many times that there were no issues, and that this proves it. Indeed, it proves that what we’re doing now is actually really good. “You need to get to the specifics,” he tells me, helpfully, after I’ve one-by-one gone through more change request data than I care to ever do again and after I’ve asked numerous people what the problems are to find absolutely nothing. No-one can give me a specific. Unperturbed, he’s asked me to contact people who have never used the tool or the process and will never use the tool or the process to ask them what specific problems they’ve already experienced with the thing they’ve never done and the thing they’ve never used. This sort of fantastic idea is obviously why I’m not progressing in my career. Sometimes I don’t think I’m sarcastic and blunt enough. The physio appointment went well. My legs still hurt! She didn’t want to work on my quads any longer than she did because she was worried I wouldn’t be able to walk the next day! 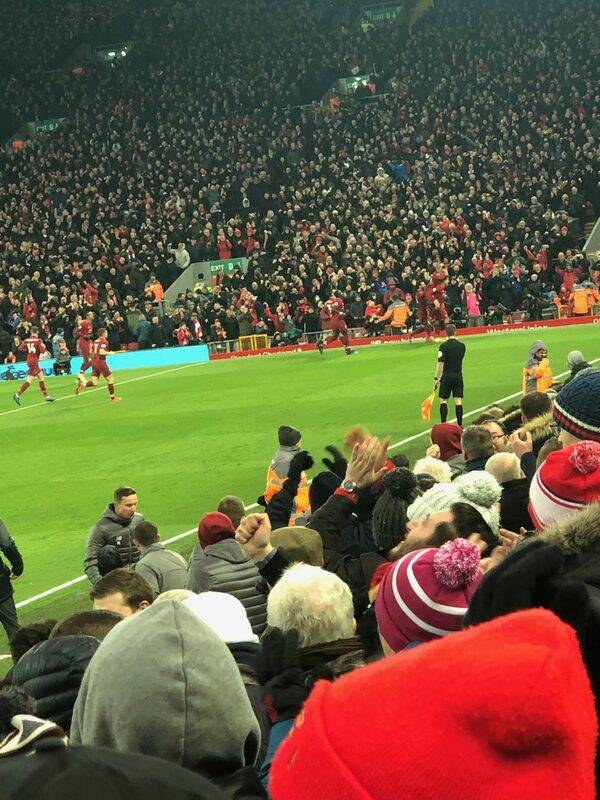 I went to watch Liverpool beat Crystal Palace yesterday. It was jeffing freezing. Palace are managed by Roy Hodgson who is arguably the worst manager Liverpool have ever had. His were the only Liverpool teams I actually didn’t enjoy watching. 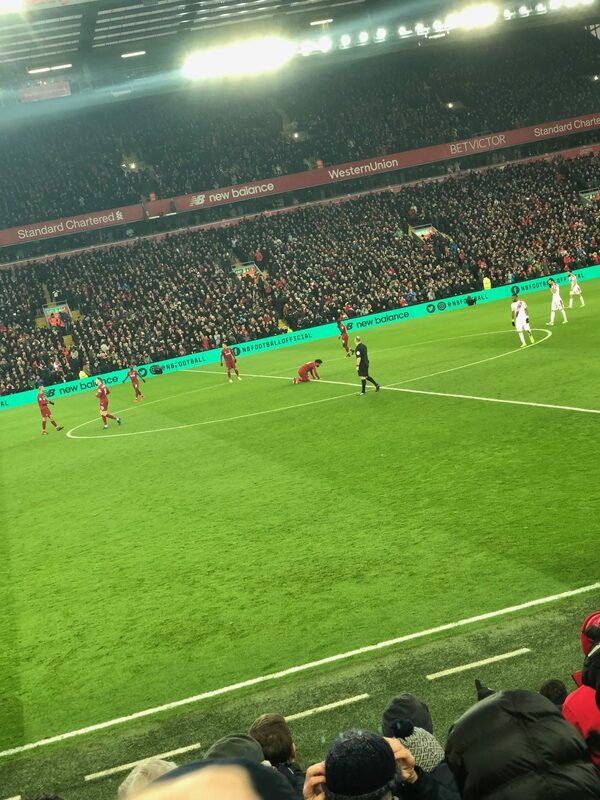 The game yesterday wasn’t much better, but it did have 7 goals. 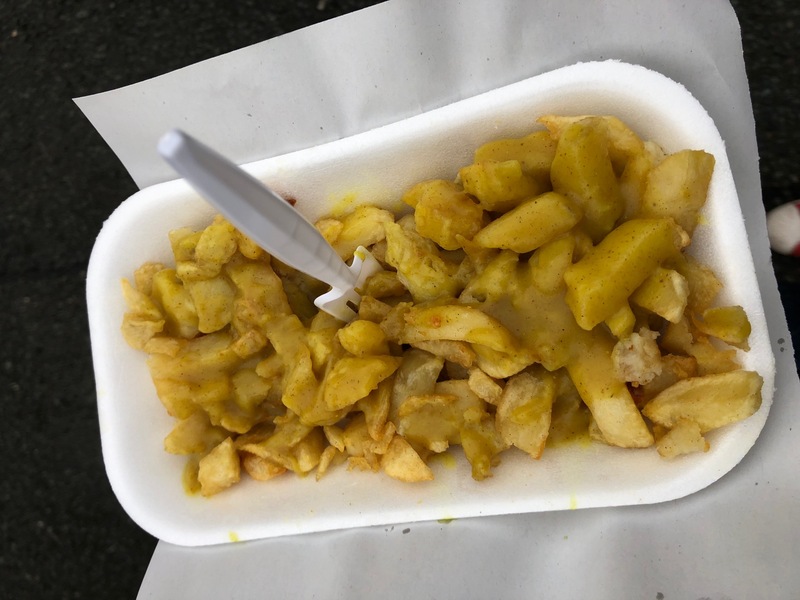 I got sausage, chips and curry on the way. 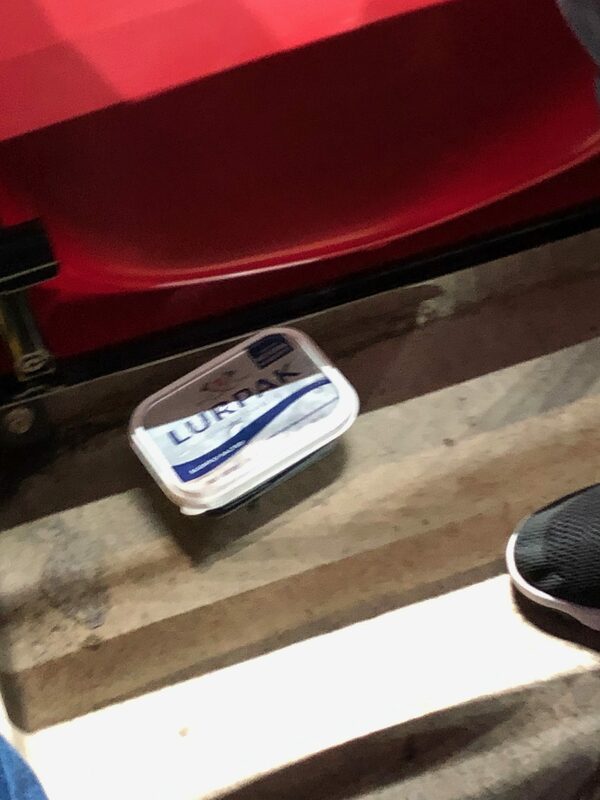 Looks like someone took something different to eat to the match, though, and left their butter there. And new Pokémon this week are shiny Feebas and Milotic, and I also got a perfect Feebas and a perfect Electrike. Hope you had a grand week.